Unless I'm staying far away from the town center or main localities of Gangtok, I would always take a hotel accommodation on EP plan (room only). The reason is there are so many great options of eating out here. Why get stuck with hotel food? 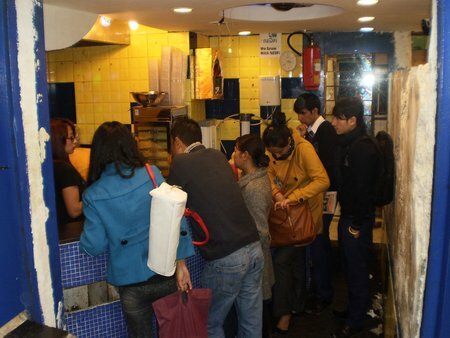 Most good eateries, restaurants and cafes are located on MG Road or nearby. This is where most tourists come to dine as there are so many choices from pure vegetarian restaurants serving north & south Indian dishes to those serving non-veg food of Indian, western, Chinese, continental & other cuisine. There are also nice cafes on MG Road. The main outlet in on MG Marg, the hub of Gangtok. 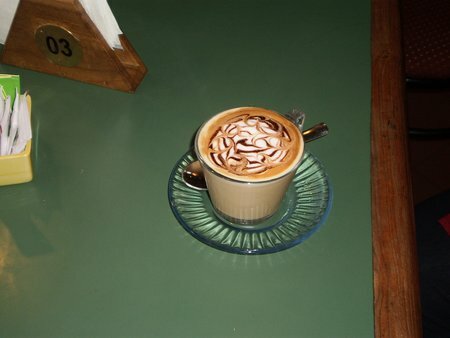 It's a modern coffee house serving excellent classic coffee of different types along with snack items. They have branch in Deorali opposite to the Institute of Tibetology and you get the same stuff out there as well. However here I'm talking about the one on MG Marg. Walk up the stairs from MG Road and enter through the door, look around and you know that you have entered a nice cafe that exuberates class and charm. Turn left and take a table next to the window overlooking the MG Road, enjoy a great coffee, some snacks and see the world go by below.... it's a great experience. Mostly confectionery items are served like cakes, pastries, patties, muffins, paninis, Danish, bread rolls, toast & eggs made to order, sausage, bacon, ham, sandwitch fritters, pancakes, burgers & stuffed grilled sandwiches, Pizzas etc. In beverages you get great tea, hot & other chocolate drinks, and all types of classic coffee. One of my all time favorites here is cappuccino with BBQ Chicken & Mozzarella Panini. Prices are reasonable. Coffees range from Rs. 50-80 per cup, snack items range from Rs. 55 - 120. You can come here in the morning for breakfast, in the afternoon for a relaxed lunch, or in the evenings for light snacks. This is an excellent pure vegetarian restaurant located right on MG Marg. Foo dis good and ambience nice for a mid-scale restaurant. Yo uknow that it's a popular place the moment you walk in, you will seldom find it empty. Most times when you come during the lunch or dinner time, you will struggle to find a table. But inside the space is good enough to accommodate many families. I was amazed to see the long list of items in the menu. Sometimes so many items could get a bit confusing. What to eat? 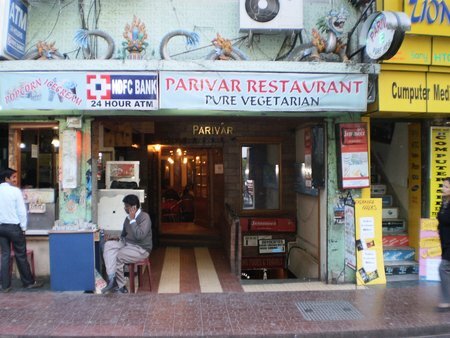 While they have comprehensive vegetarian Chinese and South Indian items, Parivar is best known for its north Indian vegetarian dishes, although the other cuisines are quite good as well. But one of the most popular here is the Thali which includes Butter Paneer Masala, Mixed Vegetables, Daal Makhani, Butter Naan, Butter Chapati, Pulau, Raita, Salad, Papad, Achar... awesome!. If you want to go for a lighter meal, you have a choice of mini Thali where number of items are lesser. They serve snacks, beverages, soups, salads, and raita as well. This is another favorite of mine and located on MG Marg. 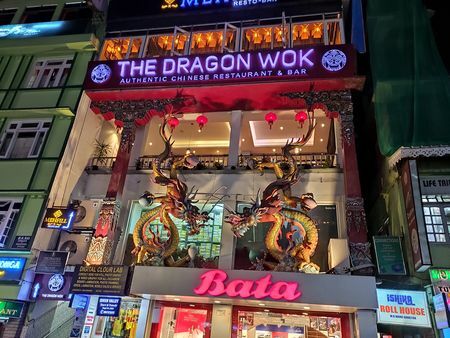 As you walk towards the Sikkim Tourism Center along MG Road, look up towards right and you will see two large dragons on a building just above the Bata shoe store. There is a narrow and steep stairway to climb and then you get to the entrance of this restaurant. If you are looking for the earlier restaurant known as Gangtalk, it no longer exists. It has been replaced by The Golden Dragon and it has a new owner. While there is an inside dining room, I always prefer the balcony that overlooks all the activities on MG Marg. The wicker chairs with cushions in the balcony and the glass tables are ideal to sip a drink followed by lunch and dinner. 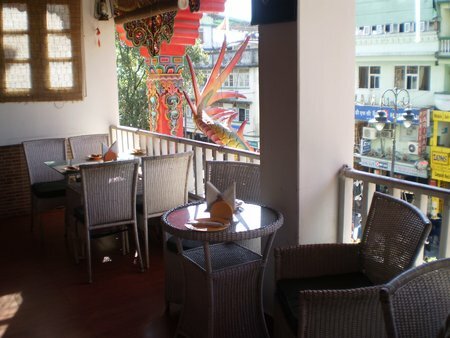 If you happen to be on a festival day in Gangtok like the holi color festival in March or the Food & Culture festival in December, this balcony would be an ideal place to watch the carnival activities. 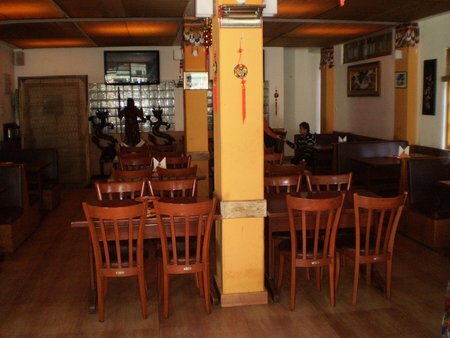 The restaurant serves nice North Indian dishes (both veg and non-vegetarian) as well as Chinese dishes. You will also get Tandoori items here. The menu is quite comprehensive and you get all standard dishes that you may expect. In Biriyani you get varieties with prawn, chicken, eggs and veg. In north Indian, other than chicken and egg, you get fish items as well like fish curry. In Chinese you can go for seafood or pork preparations other than chicken and egg. Th food quality is nice and the portions are good as well. The bar is well stocked. The North Indian main courses range from Rs. 185 to 285. Chinese main course items are also priced similar. The service is laid back, but the staff are friendly. The toilet is well maintained. Overall a very enjoyable ambience at moderate prices. 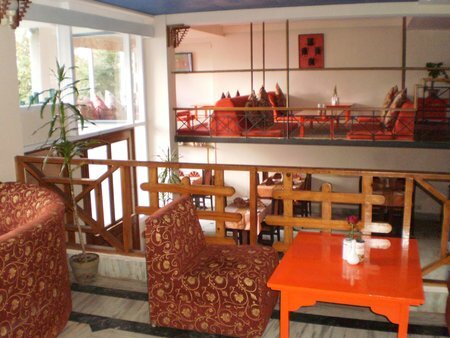 Another great Vegetarian restaurant located at one end of MG Road and adjacent to the Sikkim Tourism Center. 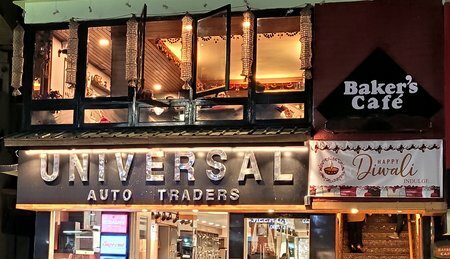 As you walk up the stairs and enter through the door, the classy interiors with window side tables overlooking the MG Marg gives you a feel that it's a relatively upscale restaurant compared to ones like Parivar. So the prices are a bit higher but not by a great margin much though. So what type of food do you get here? They have a comprehensive menu of north Indian vegetarian food and the preparations are quite good. They also serve Jain food. The Jain thali here is known as Rasoi Thali. In breakfast you get items like toast & sandwiches, corn flakes, paratha, chola bhatura, pau bhaji, club kachori etc. Beverages include milk, tea, coffee, soft drinks, fresh fruit juices etc. They also make South Indian dishes as well as pizzas, rolls, burgers, soups, salads, raita. You will also get veg momos here. Desserts include items like hot gulab jamun, cold kheer etc. So over all a good place for vegetarians. Prices in main course items range from Rs. 120 to 150. This is not a restaurant. A small take away counter located on a narrow lane and off MG Road. And guess what, it's probably one of the most popular eateries in Gangtok which makes only vegetarian rolls & momos, that's it. You won't get non-veg items here, but the kind of veg rolls and momos they make are good enough. And no wonder you will almost always find this small place crowded... people standing there to get their delivery. Try out the Paneer or special roll and the momos ... absolutely delicious. Good value for money as well. Average cost: Rs 30-35. However it's easy to miss this small gem. Look for the board on MG Road or ask a store keeper. You will then need to go a few stairs down a narrow alleyway and the eatery is on your right. Look up and you can see another board on top of the eatery. This is an upscale restaurant, part of the hotel The Chumbi Residency and located on Tibet Road, about 7-8 minutes uphill walk from MG Road. From the hotel lobby you will need to climb down the stairway for 4 floors to reach the restaurant. So when finished, you will need to climb up 4 flights of stairs. 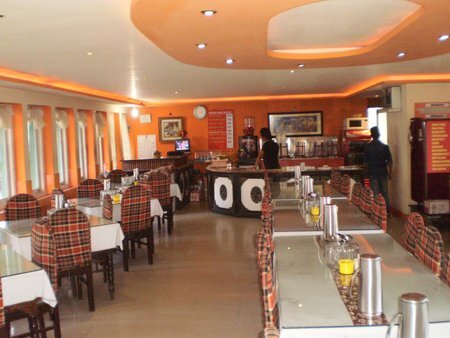 The hotel is of 3-star category and therefore expectedly the restaurant also has matching aura of class and ambience. 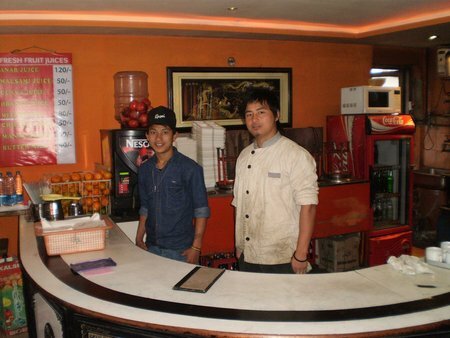 It serves Indian, Oriental, Continental and Sikkimese dishes. You get Tandoori (earthen oven grilled) items as well. Our favorites here are murg boti kebabs and tandoori chicken. The oriental dishes are prepared in Hunan and Cantonese style. Overall nice food. You can sit inside or outside in a lovely garden setting. The sofa type seating are quite comfortable. They put on music (mostly Indian music). However the service can be a bit slow at times but friendly. The restaurant is hardly ever crowded. 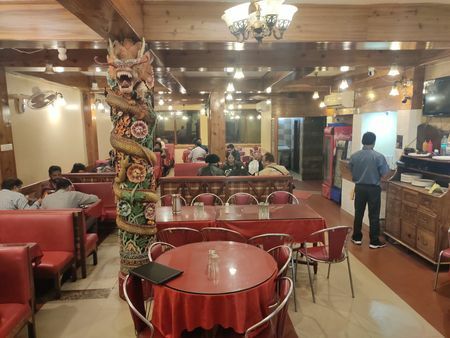 Cafe Culture located below Hotel Pandim on ground floor (below Royal Palace), Bhanu Path, on Secretariat Road - This is a family run budget eatery... great traditional food like Sikkimese, Tibetan, Bhutanese, and Nepali cuisine and even great Chinese & Thai dishes. Momos are excellent too. Portions are large, food is delicious and tastes like home made, and the family is very friendly. You get marvelous views of Gangtok city and the mountains from here. And of course the tea and coffee are great too. A great place to have authentic family run local food at a cheap price. Taste of Tibet at MG Road, Vishal Gaon - Excellent Momos and other Tibetan and Chinese dishes. 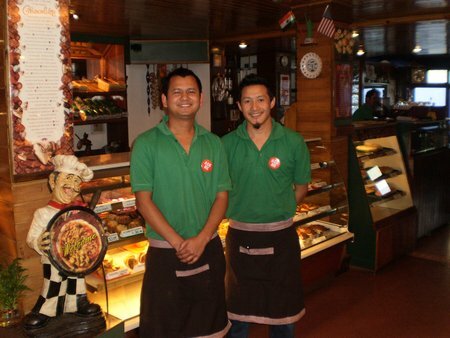 This is one of the rare places in Gangtok where you can get beef momos as well as chicken and pork momos. Try out the Chili Pork too, and of course accompany that with a Dansberg beer. They serve liquor as well. But there are hardly any vegetarian options (no veggie momos). The place often remains packed. It's a budget restaurant and price is very reasonable. Little Italy at Deorali (SNOD complex, walkable from MG Marg) - Nice pizzas with live music... they have lots of varieties. You get momos as well as Chinese dishes too like chili chicken, chowmein etc, and of course beer. A nice place for couples. Price is relatively on the higher side. Allen's Kitchen near hotel Hungry Jack (NH 31A) - Great Momos. Cacao at New Market, MG Marg - Great coffee. Some prefer it over Bakers Cafe. Cafe Tibet at MG Marg - Good coffee and snacks.